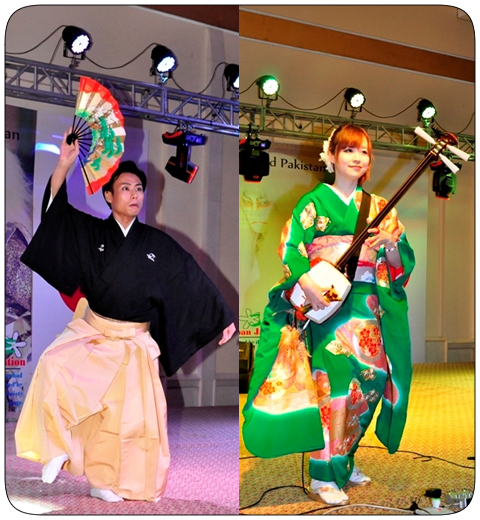 The Embassy of Japan in collaboration with the Pakistan Japan Jasmine Association organized a joint cultural performance of Pakistani and Japanese artists titled “The Fusion 2017” at Pearl Continental Hotel, Lahore on Friday 8th September 2017. An exhilarating fusion of musical and cultural performances by the Japanese and Pakistani artists drew a big applause from the audience. Year 2017 marks the 65th anniversary of the establishment of diplomatic relations between Japan and Pakistan. To mark the 65th anniversary in a befitting manner, the Embassy of Japan in Islamabad has held a variety of cultural events in various cities of Pakistan throughout the year to further cement people-to-people contact. In his opening remarks, Mr. Katsunori Ashida, Head of Public Affairs Department of the Japanese Embassy said that today’s fusion of music and cultural performances by Japanese and Pakistani artists was a great opportunity for the Pakistani people to experience the fascinating diversity of Japanese traditional music and the unique fusion of Japanese and Pakistani music and culture. He thanked the Pakistan Japan Jasmine Association and the other organizations and volunteers for their collaboration with the Embassy of Japan in holding the cultural event “The Fusion 2017” in Lahore. Mr. Ashida also thanked the Japanese and Pakistani artists for creating a mesmerizing fusion of musical and cultural performances which had greatly entertained the audience. Ms. Chie Hanawa started studying Tsugaru Shamisen from a famous artist at the age of 9. In 2000, she attended the national competition of the Tsugaru Shamisen for the first time when she was 17 years old and became the youngest winner at that time. Mr. Wakatsuki was born in 1985 and started studying classical Japanese dance from a tender age. He graduated from Nihon University, Tokyo. The Ukiyo Ren group is comprised of dancers and musicians known as “Ren”. Performers of Ren group wear traditional obon dance costumes and chant and sing at different dance festivals held in Japan as they parade through the streets. The Awa Dance Festival (Awa Odori) is the largest dance festival in Japan, attracting over 1.3 million tourists every year. Photographic glimpses of the show. Please click the thumb nail for larger image.